How to Replicate the Astra Screenshot? 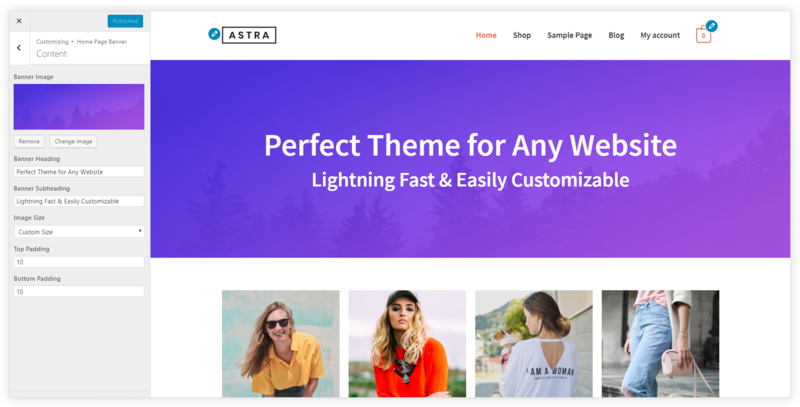 Docs » How to Replicate the Astra Screenshot? To get started, create a new page and set it as a Homepage. 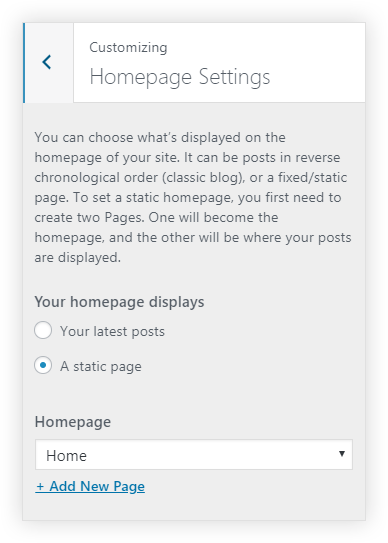 The settings can be found under Appearance > Customize > Homepage Settings > A static page > Homepage. Select a newly created page from the drop-down. This section contains the logo, navigation menu and Woocommrece mini cart at the end of the menu. Step 1 – From the WordPress dashboard, navigate to Appearance > Customize > Site Identity. Step 2 – Upload normal logo and retina logo. You can upload and use an image from the media library. Step 3 – Adjust the Logo Width. Create a menu and assign it as a Primary Menu. A setting can be found under Menus tab in the customizer. This option needs WooCommrece plugin installed and activated. 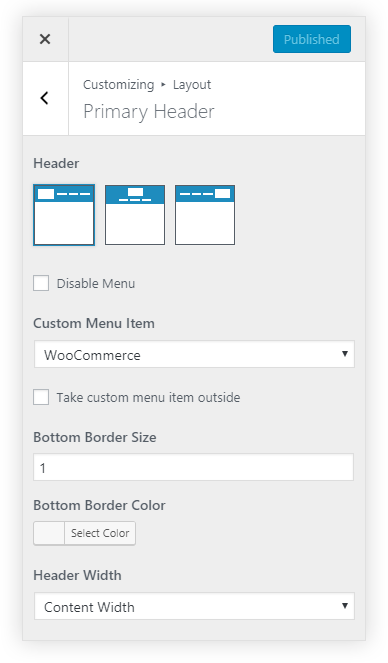 Step 1 – In the customizer navigate to Layout > Primary Header > Custom Menu Item. Step 2 – Select WooCommerece from the drop-down. 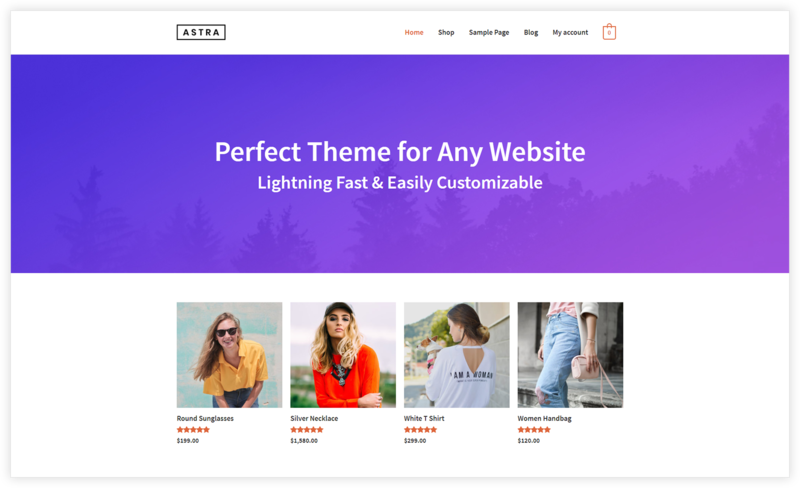 To design a banner, Home Page Banner for Astra Theme plugin needs to be installed and activated. Step 1 – In the customizer, open Home Page Banner tab. Step 2 – Under Content tab, add Banner Image, Heading and Subheading. Adjust the Image Size and Top/Bottom Padding. Step 3 – To set typography and color for Style heading and subheading, navigate to Style tab under Home Page Banner. 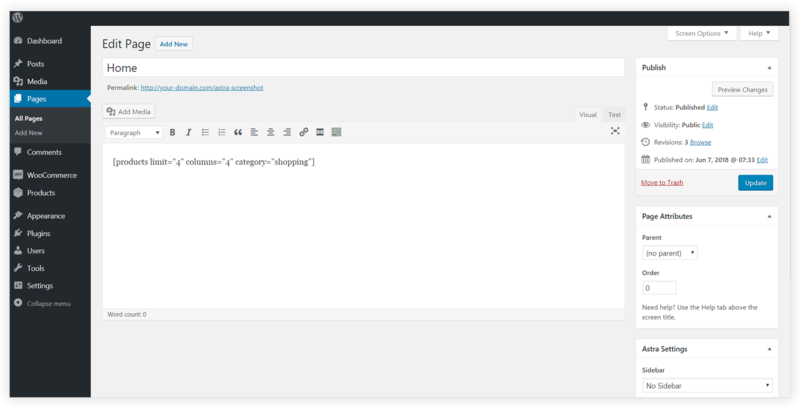 Create a new page and use a WooCommrece shortcode to display products with a particular category.